Regardless of your views, this is information for thought and is backed up with sources. Below is the Fri. July 29 article by Paul Joseph Watson and Aaron Dykes exposing the larger program. But this mandate by the ATF-- imposed without law via executive policy-- clearly violates the 2nd Amendment by conditioning the public not to buy guns. Placing suspicion on the purchase of more than two guns, filling out purchaser profile reports and making visits to customer homes all chill the notion that gun ownership is still "legal" and "upright." A type of martial law has been imposed upon the entire Southwest zone in the name of fighting cross-border drug gangs, restricting 2nd Amendment rights and placing the burden of proof upon the seller. Just as drug war border zones extending 50 miles on either side of the border are sold as "Constitution free zones" where rights can be violated, the ATF has effectively issued a freeze on gun dealers in 4 states, all while the Justice Department, ATF, FBI & Co. based in Phoenix ran a false flag under Operation Fast & Furious to arm drug gangs to frame sellers in the Southwest border zone. A similar false flag was run in Austin in 2010 where the ATF and local police staged an arrest and declared a ban on private sales in effort to shut down the Gun Shows, a favorite target of gun grabbers longing to close the "loopholes." If Barack Obama, seeking to ban guns "under the radar," can get away with this bureaucratic tyranny through executive policy under his the Presidential agencies, then the executive branch can get away with anything. President Obama "the Constitutional scholar" has dangerously ruled by decree far too many times already: waging war with Libya while arrogantly saying he doesn't need to consult Congress; taxing carbon dioxide through the EPA when Congress wouldn't pass legislation; ignoring the Constitution by taking foreign titles under the U.N. and more. Now, he will cynically wage 'war' on the drug gangs (openly backed by top Wall Street banks and armed by the executive branch) in order to attack the second amendment by proxy. Gun dealers, induced to inform on their customers, will be painted with fault as firearm restriction sets in-- unless we say no. 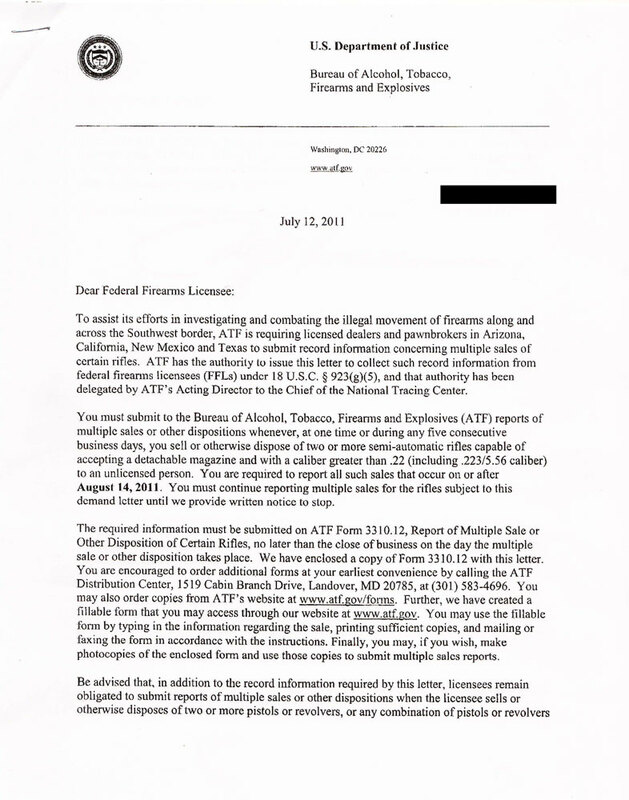 Even as it finds itself embroiled in a scandal that saw weapons being deliberately sent to criminal gangs in Mexico, the ATF has issued a letter ordering firearms dealers in border states to report sales of two or more semi-automatic rifles, and is following it up by harassing gun owners with intimidating home visits as well as threatening gun dealers to spy on their customers. As the Justice Department announced earlier this month, "All gun shops in four Southwest border states (Texas, California, Arizona and New Mexico) will be required to alert the federal government to frequent buyers of high-powered rifles." The ATF letter also orders gun dealers to report to the feds sales of "two or more pistols or revolvers, or any combination of pistols or revolvers totaling two or more." 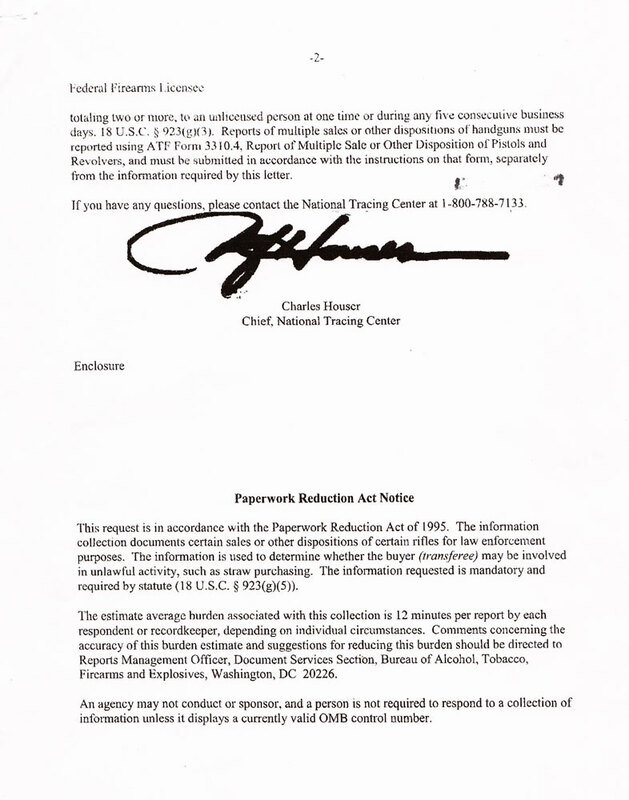 The letter, which was subsequently sent out to gun dealers and has since entered the public domain, orders firearms retailers to "Submit to ATF reports of multiple sales or other dispositions whenever, at one time or during any five consecutive business days, you sell to an unlicensed person or otherwise dispose of two or more semi-automatic rifles capable of accepting a detachable magazine and with a caliber greater than .22 (including .223/5.56 caliber)." The directive takes effect from August 14, 2011. The federal government is enforcing a law that was never passed.